The first RV defines the quality of your lifestyle experience. Spend the time to find one that will work for you. Here are four tips on buying your first RV. Spend as much time to find the right RV as you would in buying a house. Join e-mail lists where RV owners discuss different types of vehicles. Ask for suggestions about what brand to buy, new and used. Purchasing a used high-end coach or fifth-wheel trailer gives you long-term enjoyment and saves you the disappointment of a new-purchase-gone-bad. Buying used often means the original owner already purchased many after-market enhancements and spent the time at the manufacturer repairing the glitches...now you get to benefit and drive away with a highway-ready rig. Often the new lower-priced RVs need after-market suspension and safety mechanisms added to make the driving experience acceptable and safe. If you're out shopping for new RVs, remember, when the glamour of the new RVs begins to overwhelm you - think of "value for the dollar." Ignore the glitter of brand new interiors. Check the wall and cabinet construction on the inside. The best way to build confidence in this new lifestyle is to jump in the RV and roll down to the nearest driving school. There are driving schools offered by RV clubs and private driving schools that come to your location. If you're a woman traveler, the RVing Women’s organization offers a driving school in October this year in Oklahoma to coincide with their national rally. They offer a forum, rallies, caravanning opportunities, and many activities nationwide. Getting involved with other travelers is another great way to find out about the lifestyle. There are rallies, RV shows, group get-togethers, and festivals in every state. The Good Sam Club has something on their schedule every week. Find the great destinations recommended by other travelers at RV Lifestyle Experts.com. Volunteer to be docents or camp hosts at any of the National, State and County parks, this includes beach properties. For short stays between destination parks, purchase a discount campground directory, for example, Passport America. This discount club membership costs around $45 per year and provides a 50% discount off nightly rates in commercial RV parks across the country. Explore membership campgrounds that provide low-cost stays at private campgrounds. Thousand Trails provides the largest number of private campgrounds scattered around the USA. A resale membership can be as low as $750, with annual maintenance fees around $550. Obviously, there are great savings in the clothing budget. The RV lifestyle is a casual affair. Bring along jeans, shorts, t-shirts, hiking boots, a BBQ grill, lawn chairs, and a LED lantern for nights under the stars. Pack a few light jackets and a knit cap for the Northwest destinations, flip-flops and tiny umbrellas for the rest of the journey. Buy the RV that works for you, take your time - and buy quality. Get to know the lifestyle by joining clubs, groups, and online forums. Volunteering and workamping help introduce you to the fun and adventure of this lifestyle. Save money by traveling slowly and staying longer at your destination. Purchase discount cards for cutting costs on the overnight stays. Forget the past routine and create a new adventure every day. Reserve judgment on new experiences had until tomorrow dawns. There are many changes in this lifestyle, embrace it. 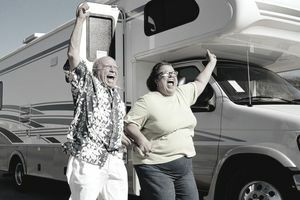 Margo’s blog, MovingOnWithMargo.com, follows all things related to the RV lifestyle. For more information on the RV lifestyle, see her eBook, The RV Lifestyle: A Dream Come True.